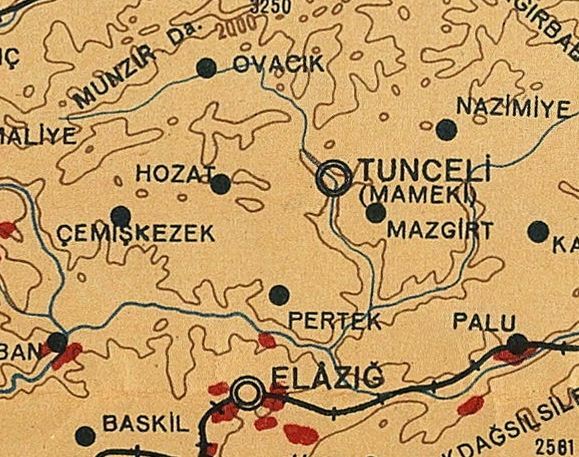 A small detail from last week's Turkish Tobacco map (produced by the Tekel General Directorate in 1950) that I only noticed after posting it: you can actually see where the name Dersim has been whited out and replaced with the name Tunceli ("Hozat," which later fell out of favor, remains on the map). For more on the nationalization of place names - particularly those like Dersim with problematic legacies for the state - see the work of Joost Jongerden and Kerem Oktem. Naci Dilekli (of Dervish Map Challenge Winner fame) writes in with the following: "Actually, I think there are multiple problems with this map and renaming. Tunceli is not located where it is whited out and typed on the map. Tunceli is located further east, which is in this map Kalan (Mameki). Here is what I think happened: I am not an expert on this but I think Dersim is also a name for Hozat (center of Dersim sancak in Ottoman times). And the "sensitive" mapping personnel thought this placename Hozat (Dersim) referred to Kalan/Mameki/Dersim/Tunceli, and mistakenly referred to it with this inaccurate name. By the way, that map is geographically quite inaccurate, and makes things further confusing." Indeed, given where Elazig and Pertek are it certainly looks like the city name that was whited out probably refers to what is now Hozat rather than Tunceli. A close up from the wine map (http://farm9.staticflickr.com/8258/8662522579_fbe512fb0a_o.jpg) makes this seem even more plausible. Quite possibly the map they were basing this on was so old that it still showed Hozat underlined in red from when it was the center of the Dersim Sanjak (up until 1922 according to vikipedia). So quite likely they actually changed "Hozat (Dersim)" to "Hozat (Tunceli)" to reflect the renaming of the province without addressing the fact that Hozat wasn't the il merkezi anymore.